Did you know that anxiety disorders affect one in eight children? I learned years ago that anxiety issues can be generational, due to environment and/or genetics and that the chances of me having children with anxiety disorders were much higher, due to the fact that I was diagnosed with my own. Because of that, I’ve tried really hard to be prepared for helping my children with fears, worries, and anxieties, as they arise. It’s also forced me to understand the importance of taking care of myself and my own anxieties so that I can set a good example, and fully acknowledge the challenges that they face in working through it all. Even if you don’t have anxiety issues, it’s possible your child, or a child in your life is, or will, deal with one: one in 5 children will develop a mental health issue. One of the best things for helping children with anxiety is talking. There is something about putting a voice to your worries, and speaking them aloud that is therapeutic, especially when a trusted adult is listening. That’s why children’s books on the topic are so great: you can read them together and talk about them. They allow you to share what has worked for you and openly discuss a shared emotion. Sharing your own journey with your child, in an age-appropriate way, doesn’t make you look weak to your child. Quite the opposite: it helps your child see that there is hope and that someone does understand them. An excellent interactive book written for children, that will help your child feel empowered to do something about their worries and anxieties. Written by a clinical psychologist, this book was conceived after she saw a need for practical take-home help for the children she was seeing in her office. Worries and fears have a way of getting bigger and bigger when we don’t talk about them. For children, with their big imaginations and difficulty understanding real vs. unreal, this can begin to feel huge and insurmountable. This book illustrates this well, and also shows children how problems can begin to feel more manageable when talked about and shared with parents and other trusted adults who can help. Common worries are humorously, yet effectively illustrated throughout this book, making it both relatable and entertaining for children. Children will also learn techniques for working through their worries, through creative problem-solving. This book is great to read together and discuss the various fears that your children are experiencing and how they could be handled. Deep breathing is very important for overall health and well-being, but many children do not know how to properly breathe, especially when anxiety starts up. The charming characters teach children how to relax through breathing, and encourage children to use the techniques to help fall asleep. Little Mouse has many fears, and each one is described throughout this beautifully laid out, mixed media book. There are pages that fold out, and the child is encouraged to list and draw their own fears, as Little Mouse has already done. Because of the layout of the book and the use of technical terms, it is a book for younger children to have read to them by an adult, or for older children. 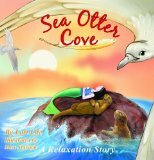 By the author of Sea Otter Cove, this book also helps promote proper breathing and introduces children to calming techniques that can help a child through times of anxiety and worry. Both the boy and the bear demonstrate good breathing habits, and reading this before bedtime will certainly have a positive effect on sleep. This charmingly illustrated book, is excellent for children who struggle with feelings of panic and panic attacks, it teaches skills that children will find useful. There is a repetitiveness to the text that is calming, and children will be able to see themselves in the situations that Annika finds herself in and starting to panic, and learn from how she calms herself each time. Kevin Henkes is one of my favorite authors for children. His ability to write about and portray the unique personalities of young children make his books enjoyable to read and relatable for children. Wemberely is a mouse who worries about everything, and by the end of the book, she is beginning to realize that much of what she worries about, has no cause for worry. This book is designed to help children feel more in control of their worry, and their ability to manage and work through it. It also is good for guiding children to be able to identify their anxiety and what is causing it. 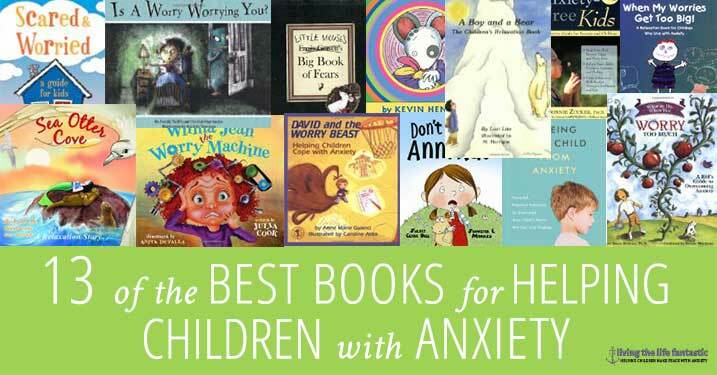 A great resource for older children, this book is broken down into parts that help give children methods and tools for dealing with their anxiety, while also explaining some of the more serious problems involved with anxiety and the need for counseling, in some children, to help work through it. This is a book children will be able to refer to often. This book is written for children with autism, who are also dealing with anxiety. Self-calming techniques and a number rating scale, for identifying levels of anxiety are some of the many techniques presented. Receive free Mindfulness Journal and Gratitude pages when you join our community. You'll also stay up to date on tips & resources that will help you help your child manage anxiety. Sound advice and extremely informative, this book is relatively new to our household “help for anxiety library”, but has already become a ‘go to’. Anxiety is the number one mental health problem facing young people today. Childhood should be a happy and carefree time, yet more and more children today are exhibiting symptoms of anxiety, from bedwetting and clinginess to frequent stomach aches, nightmares, and even refusing to go to school. Parents everywhere want to know: All children have fears, but how much is normal? How can you know when a stress has crossed over into a full-blown anxiety disorder? Most parents don’t know how to recognize when there is a real problem and how to deal with it when there is. No child is immune from the effects of stress in today’s media-saturated society. Fortunately, anxiety disorders are treatable. By following these simple solutions, parents can prevent their children from needlessly suffering today and tomorrow. I’ve written about this book before, and I can’t say enough good things about it. This is a book that you read with your child. But the neat things is that there is a section for the adult, and a pull out section for the child that explains the same things you are reading in ways that the child can wrap their head around. It’s been a great tool for helping us help our children, all of whom deal with anxiety, fears and worries on various levels. Be sure to also check out our post with books for teens dealing with anxiety. 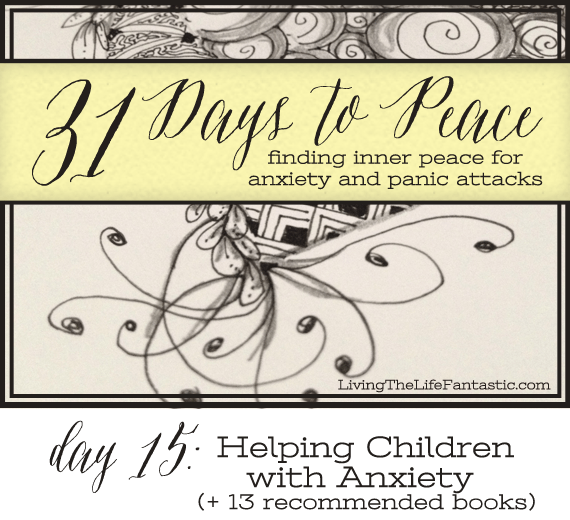 This is the 15th post in a 31 Day Series: 31 Days to Peace: Finding inner peace for anxiety and panic attacks. Start from the beginning here. Oh, I wasn’t aware of these! What a find your site is! Thank you! Will you take a look at my website and see the four published titles I have for children on the spectrum. Karla: I’ve read this post a few times and have had it bookmarked since you posted it. My daughter has anxiety about many many things–and it varies with severity. Anyway, I’m finally to a point where I just don’t know what to do. She can’t or won’t verbalized what the problem is in the middle of her freaking out. And I’m finding myself being less compassionate in the middle of it. But getting more concerned as a whole–as she grows, can she handle LIFE?! Anywhoo–I’m off to find these books. 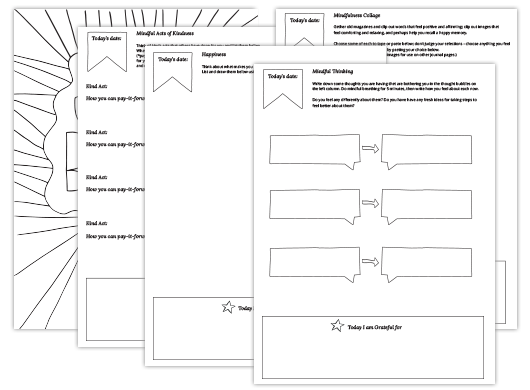 Any other blogs or resources for kids to recommend? Hi OhAmanda! I follow your blog and we do Truth in the Tinsel here at our house…thank you! Just today our pediatrician recommended one of the books on this list for my son and I was concerned about a “Christian” Perspective on the problem and google led me to this blog and your question…do you mind my asking if you tried any of these books and if they were in line with scripture?? Oh, specifically, any Christian resources? As a sufferer of anxiety and panic attacks, and a writer and illustrator, I decided to write about it and created the fantasy novel The Other Side of Eve. A young adults/MiddleGrade novel with two young female protagonists going on separate journeys to find answers to their pain. One suffers from anxiety and panic attacks and throughout the novel searches for answers and finds them. (They say write what you know!) and I know anxiety and how confused I was as a youth. But now I am in control and not the other way around. The pre-order is available for ebook & Printed version will be out March/April 2015 through Amazon and major online retailers. I hope it reaches the hands of those who need to get away from it all and hopefully find an answer inside along the way. Thank you for sharing, Paul! Looks like a great book – looking forward to checking it out. I’m sorry to hear your son is dealing with those thoughts. Keeping you both in my own thoughts. I’m working on a post for groups and sites for both children and parents of children, that deal with anxiety. My middle grade book, The Crystal Navigator, addresses the subject of school anxiety. A sixth grader loses her confidence after her mind goes blank during an oral report. She is so afraid of being laughed at that she vowed never to speak in class again. In a thrilling adventure back in time to meet great artists, Lucy learns to trust her ideas, recovery of her confidence, and triumph over her fears. Messages of self esteem, empowerment, and learning to see the magic in everyone. I routinely visit middle schools and speak to children about my book and how I overcame fear of making mistakes. I thought perhaps you might find the book helpful. I was also wondering if you felt any of these books would be appropriate to be used as read alouds in a 2nd grade classroom. I was just going through my comments to make sure I hadn’t missed any and discovered yours! My apologies for the delay. For the books as read-alouds: under the Books For Children section above, the first book and the last two books are more workbook type-books. But the others would all work well as read-alouds. Thank you for your comment! I hope that is helpful. My daughter and I read The Crystal Navigator together. She had had a humiliating experience like Lucy. This book did wonders for her self esteem. the Crystal Navigator. You feel this is written by someone who cares for their subjects, and wishes to present them in the best possible light. Children come away feeling that there is magic inside them.